Manufacturer of a wide range of products which include pneumatic direct heat sealer. 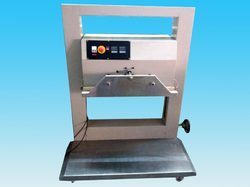 The Pneumatic Direct Heat Sealer is widely used in the plastic industry. The force to be applied on the plastic specimen can be adjusted between 15 and 180 Kg, as per requirement. The temperature of the Presto Heat sealer is also adjustable. The instrument has been provided with Digital Display and is Microprocessor based. Adjustable force can be applied. Temperature adjustment is also possible. Separate temperature sensors and controllers installed for both jaws. It is possible to maintain upper and lower jaws at different temperatures. Fitted with special imported P.I.D. logic temperature controller. Looking for Pneumatic Direct Heat Sealer ?